WWOOF(World-Wide Opportunities on Organic Farms) is a world-wide movement linking volunteers with organic farmers and growers to promote cultural and educational experiences based on trust and non-monetary exchanges helping to build a sustainable global community. Got to the 4th WWOOFing farm after cycling 6km to the east, along the river from Waikanae town. We almost went past as the house was invisible in the bushes. Passing through the path in the bush we were able to find an old house. Knocked on the door then a host Rozellia welcomed us to a room we shall stay in. "Welcome! Glad to meet you." "Thanks for accepting us. We wish your kind help." "By the way, did you receive a message that I sent? Our water tank has temporarily run dry and restricted use. We can't shower or use the washing machine, is it still fine for you? Same as in Australia, the water supply facilities of the local region are not well-equipped. In general every house has a water tank and it refilled with rainwater. Saving water is not that difficult to us since we had a several time of wwoofing. But no water... unluckily the tank run dry just a day before our arrival. Buying water to fill the tank is not simple because the companies are on New Year holiday season so it seems to be workable a week later. No other option to us except staying here. Unpacked and took some rest. 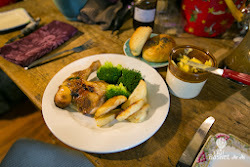 After a while, Rozellia called us "Come, dinner is ready". 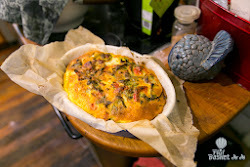 Beautiful dishes of "New Zealand styled pasta with green mussels" are on the kitchen table. Heard that green mussels are famous in New Zealand but haven't tasted it yet. Moist pasta noodle, chewy mussels, and the sweet juice came out from the shell, flavors were well blended so it was very delicious. We knew later that she was a chef. Indeed! Every meal was so wonderful during our stay there. Feeling full with yummy dinner is another name of happiness. Next morning, Rozellia took us to the garden field crossing the bush path. Only few plants of vegetables were growing in small area, the garden was overgrown with weeds. 1,300 sqare meters sized big land was in a state of total neglect quite for long period. 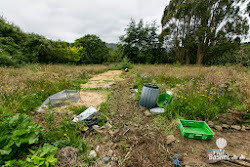 Our mission is weeding and then clearing land. Rozellia liked us wearing gloves and work clothes. 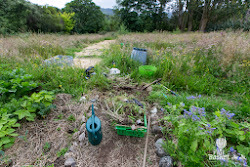 Pulled up the weeds by using hoe and shovel and restored the original shape of kitchen garden. After then, covered the path with pine needles brought from the small pine forest nearby. 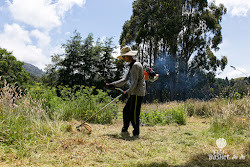 On the big land left around the kitchen garden, we had to use a weed whacker. Thinking as it were our land we did our utmost to make it better, spending 4 or 5 hours everyday. The only problem was water shortage. Passed a few days but nothing happens and just all are waiting for rain. "I can't stand any more, let's go to river! We saw one bridge on our way to come here. Waikanae river runs under that bridge, less than 2km down from here, and lonely place. Head for there bringing swim suit, toiletries and towel. We jumed in the river once arrived. Gentle deep just around my knee. It recalled us our childhood when we played in the streem naked. Cool and refreshing! We washed away the fatigue of the day. Water was not a problem at all. Jowrney might be pretty tired of weed whacker last day so got up late. So convinced on weeding as often said he had to only weeding for 6 monthes during his air force days, but he worked too hard. Stacey returnd home from morning walk in great excitement, saying to Jowrney. "Darling, you wanted to try sheep shearing?" "Yes I did. But how can do all as as we want..."
"On my way of morning walk I met a rancher in the neighbor, they do sheep shearing today. We can come to see!" "Really? Yeah! Let's go, check it out"
Healthy strong three workers were busy in the warehouse building, kinds of cowshed. Two of them were doing sheep shearing and the other men was sorting the fleece by quality. The body parts are the best ones, it looks quite good as we see, pressed before being sack packed. Very warm and soft. Head and belly side were separated in the corner of the floor and then, dirty parts of hip and foot went to rubbish bin. The sheep were standby for shearing in the line. As Stacey asked the age of sheep, the worker, checking the teeth of it, said that this is youth, about 2 years old. The youth is as big as adult male it produces good fleece once a year. While, the young is sheared every 3 or 4 monthes depending on its weight. Most of the sheep were so gentle when sheared but some one was struggling which got hurt by clipper. One of them proposed us to try it. Stacey was surprised to be handed a clipper from him and very carefully moved the clipper, much afraid of getting it hurt. She felt the warmth around it's skin and fleece. We said thanks for giving a chance of such great experience to them and came out of the building. There was another flock of sheep outside, a bald head, it looked like a goat. Thanks for providing fleece to human being. The last day of the year. Children of Rozelia family were gathered all together. Enjoyed drining beer and barbeque party with them and felt asleep while playing hide-and-sick with kinds. A new year has come when we wake up and we are not long to leave this house. Ended some more works and visited the river one last time. We washed away the sweat and fatigue in the river.